Laying out some Fimo against a nuno felt wrap last night to try and select the colours I wanted. Of course I realised as soon as my order of polymer clay arrived that I didn't get half enough blocks of soft subtle colours and I only ordered one white and one translucent block, silly me. The green that I got is much sharper in colour than I expected also so this afternoon I headed into Carlow after teaching to stock up on some more light colours and white. 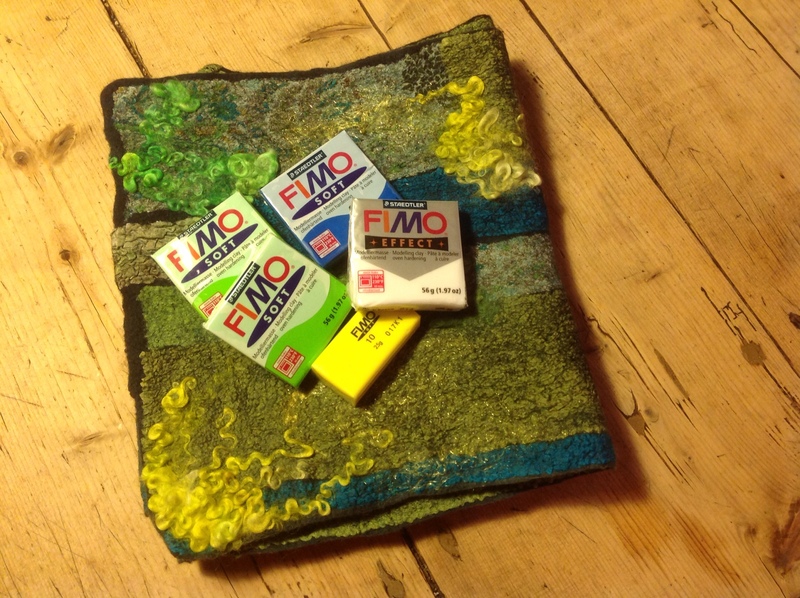 The Fimo is much more expensive there than online but at least I can now work again and do some more experimentation this evening, tomorrow I'll be felting the complimentary pieces in the morning then assembling all the jewellery in the afternoon. At least that's my plan anyway and I'll really try to stick to it! This entry was posted in Felt, Felt jewellery and tagged Felt, felt jewellery, Nuno, nuno felt, polymer clay, polymer clay jewellery by Nicola. Bookmark the permalink. I don’t think Fimo has ever changed, I still have some from 20 years ago that looks exactly the same. It is very hard, but I think with some serous massaging it is still usable. I have wanted to try Fimo for a thousand years. That’s it… I’m going to do it ! But my, your felting is exquisite. Thanks Jen, just go for it!